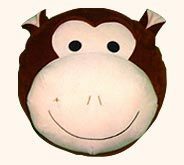 Well depicting the naughtiness of the kids, our furnishings based on the monkey theme is designed from soft and cozy fabrics. Distinct fabric material ranging from cotton to polyester and colour combinations are used in our furnishings to meet the popular demands. The shapes of the cushion covers, pillows, mats and other furnishing articles is done to match the complete d?cor f the kid's room. 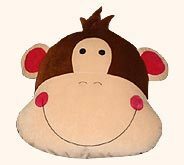 Desc : This naughty monkey will surely be the best friend of all the children. 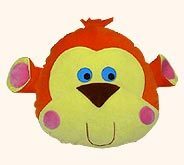 With soft yellow head, eye catching red nose and mesmerizing pink grin, this monkey toy steals the heart of little ones unknowingly. 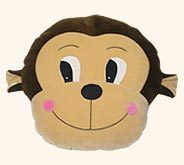 Desc : With fascinating features such as pale mouth, brown head and black round eyes, this monkey soft toy is both realistic and fun. Watching lying on the kid's bed luxuriously, real monkeys will also feel jealousy from this. Desc : This brown haired and pink faced monkey looks sympathetic from his facial expressions. Innocent children will not want to stop hugging & opening their heart in front of him in lisping words. Desc : This fashionable monkey desires to keep pace with modern time. His stylishly cut hair are waving in air and seeing them he is smiling splendidly. Favorite of all fashion conscious kids. 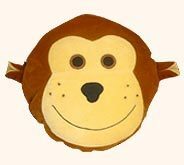 Desc : This two toned monkey toy has looped ears, marvellous eyes and a wide smile on his face. 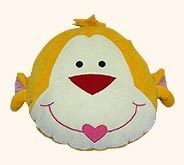 If any kid sits on him with pleasure and leisure, this monkey will not weep & bite and continue smiling. Desc : To allure the infant & toddlers, this monkey has beautified himself with various cheerful colors. Red hair, blue eyes, black nose, yellow face and best of all reddish cheeks- seeing this monkey, whose heart will not be greedy. 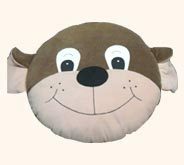 Desc : Eyes of this rascal monkey are moving in quest of a little playfellow, who could play, do mischiefs and sleep with him forever. Does any kid want to be the friend of this monkey. 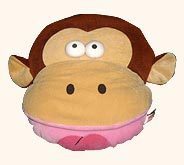 Desc : This intelligent looking monkey will be the king of all monkey toys, which are in the collection of kids. Children can caress his pink chin & brown hair and can pat his shoulder congratulating him to be an emperor.